Inheritance is a language mechanism, that allows us to group common characteristics together into a set of related items, which we can then redefine into more specific subsets. In Java terminology, the general class that holds the group of common characteristics is known as the superclass and the specialised subset of this is known as the subclass. We achieve this hierarchial connection in Java using the extends keyword, wherein the subclass extends the superclass. By extending like this we have created an inheritance hierarchy where the subclass inherits the traits of the superclass, in other words the members of the superclass, assuming the access modifiers permit inheritance. Because the subclass is more specialised it can override the instance methods members of the superclass and also add new members of its own. We used some new terminology there for members, did you notice? Yes we said override as opposed to overload, which we have already come across in the Objects & Classes section, in the Methods lesson. When we override the instance method members of the superclass in a subclass, we are writing a more specific method for use by the subclass that overrides the inherited method. We will go into overriding in much more detail in the Overriding Methods section, later in the lesson. We do not override instance variables in a subclass with the same identifier in the superclass. This is known as hiding and will be discussed in the next lesson in Superclass Members. The first thing we do is make a Car class, which is all our original Vehicle class held; so we don't need to change anything here. Our new Bus class comes next and we need a new instance variable conductor. Last is our Truck class, in which we are going to override the carry() method from the Vehicle class. Press the button below to cycle through our Inheritance explanation. Here we code and test the Vehicle class which is just a normal class like any other we have seen so far. This class holds all the generic stuff our subclasses will need in one place, thus avoiding code duplication. The above screenshot shows the output of testing our Vehicle class. As metioned earlier in the lesson we create an inheritance tree in Java using the extends keyword, wherein the subclass extends the superclass. By extending like this we create an inheritance hierarchy where we can use the more abstract superclass members, as well as more specific subclass member overrides where required. Ok, time to code up the first three classes of the hierarchy shown in the slide show above, starting with the Car class. 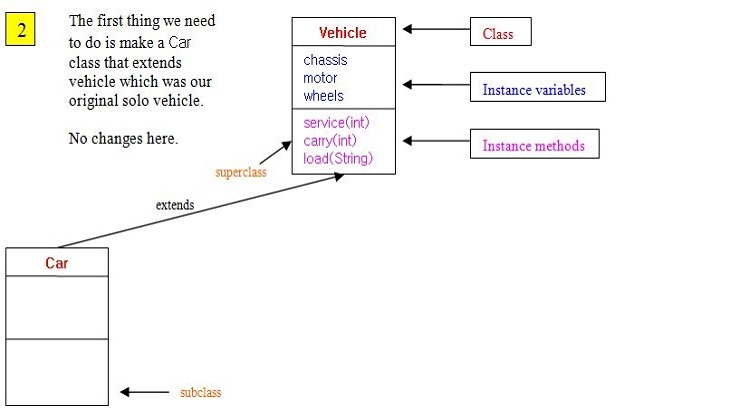 Here we code and test the Car subclass where we use the extends keyword for the first time to subclass the Vehicle class. The Car class is very simple as it just uses all the same members as its superclass, the Vehicle class. Save and compile our Car subclass in directory c:\_OOConcepts in the usual way. 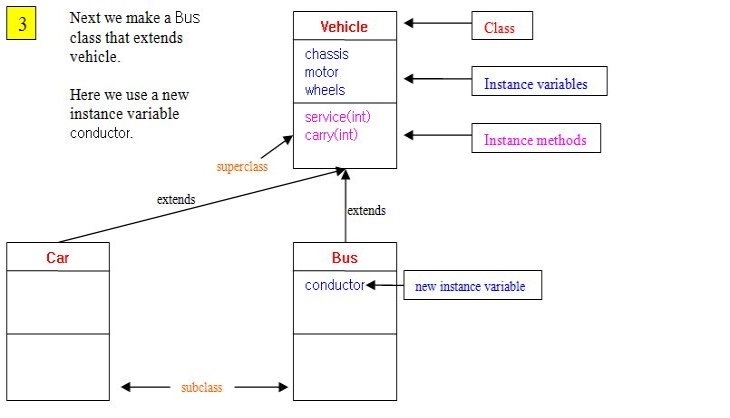 Here we code and test the Bus subclass where we use the extends keyword again to subclass the Vehicle class. With the Bus class we need to add a new instance variable conductor to the class. The superclass Vehicle has the rest of the stuff we need. Save and compile our Bus subclass in directory c:\_OOConcepts in the usual way. The above screenshot shows the output of testing our Bus subclass. The class works as intended and uses all its inherited members of the Vehicle superclass as well as the new instance varible conductor to output some messages. 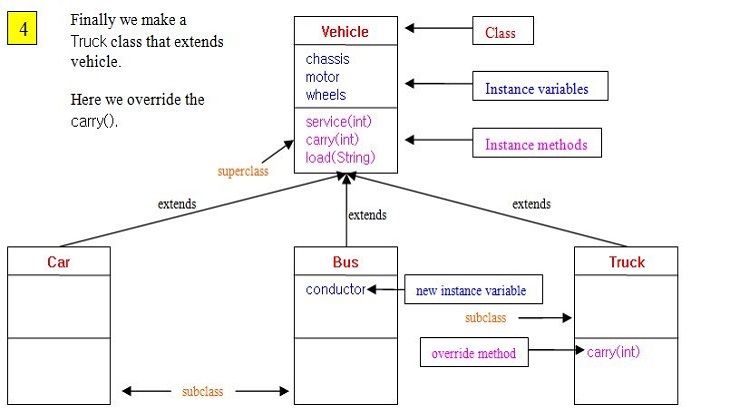 We just have one more subclass to code in our simple inheritance tree, the Truck subclass. 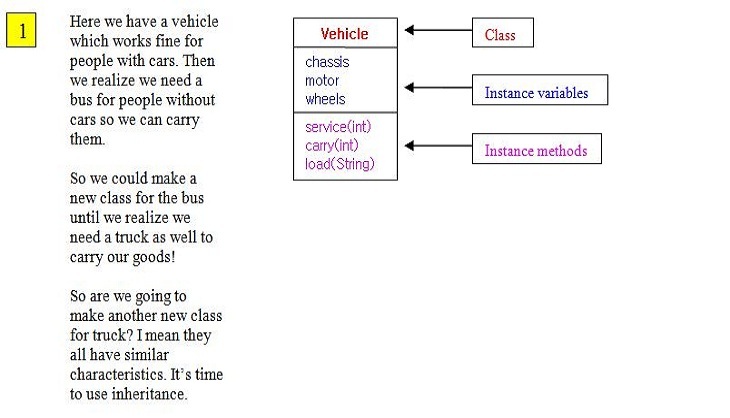 This class overrides the carry() method from the Vehicle superclass. This is our first look at coding a method override and so we will just cover the basics and rules in this lesson. A method override must adhere to the contract it has with the superclass method. This contract being, a method override must have exacly the same arguments and return type (or co-variant thereof) as the superclass method with the same method name. This is different to our examples of overloaded methods in the Objects & Classes section, in the Methods lesson, in which the argument lists had to be different. In fact if you change the argument lists, that's what you end up with an overloaded method. So to make sure we are doing a method override we need to keep the contract. Time to code up our Truck subclass. Here we code and test the Truck subclass where we use the extends keyword again to subclass the Vehicle class. With the Truck class we need to override the carry() method from the Vehicle superclass. The superclass Vehicle has the rest of the stuff we need. Save and compile our Truck subclass in directory c:\_OOConcepts in the usual way. When we override a method, the overriding method can't be less accessible. With the changes to the Truck subclass save and recompile it, it should compile fine now. The above screenshot shows the output of testing our Truck subclass. The class works as intended and uses the inherited members of the Vehicle superclass, our carry() method override to output some messages. A method override must have exacly the same arguments as the superclass method with the same method name or you end up with an overloaded method. A method override must have the same return type (or co-variant thereof) as the superclass method with the same method name. When we override a method, the overriding method can't be less accessible, but can be more accessible. You cannot override a method marked with the final modifier. You cannot override a method marked with the static modifier as overridden methods pertain to instance methods and not the class. In fact if you use the same static method and parameters in a subclass as a static method in a superclass this is known as method hiding and is discussed in Static Overrides?. There are other rules regarding exceptions declarations when using overrides and these are discussed in the Flow Control section when we look at Overridden Methods & Exceptions. Hopefully you're getting a feel for how inheritance works now and how we can build up an inheritance heirarchy to avoid duplication and streamline more specific objects. The above screenshot shows the result of trying to compile class B. You can't mark abstract classes as final or you will get a compiler error. Abstract classes, by definition, need to be extended. You can also use the final keyword to create final local variables, final instance variables, within parameter lists and for creating java constants. In this lesson we introduced the OO concept of Inheritance, what it means and how we start to use it. We continue our investigation of inheritance and conceptualize where our objects fit into the hierarchy.